MYRTLE BEACH,S.C. (July 8, 2014) - The Myrtle Beach Pelicans, Class A-Advanced affiliate of the Texas Rangers, are pleased to announce that August 2 is Coaches vs. Cancer Night at TicketReturn.com Field at Pelicans Ballpark. The night combines two previously scheduled promotions, USC/Clemson Night (originally scheduled for July 11th) and NFL Night to help increase the awareness and support for the Fierce Fallon cause. Fans are encouraged to wear jerseys of their favorite NFL or college football team out to the ballpark. The "Coaches vs. Cancer" concept has developed nationally as a great way to raise money and awareness in the fight against cancer," stated Pelicans General Manager Andy Milovich. "We're incredibly excited to have the support of the two highest profile coaches in the State of South Carolina in our personal fight with Fierce Fallon." In December 2013, then-nine-year-old Fallon Emery of Carolina Forest was diagnosed with brain cancer. Fierce Fallon is the foundation that has been created in the aftermath, designed to help cover the costs of her treatment, travel, and day-to-day living expenses. 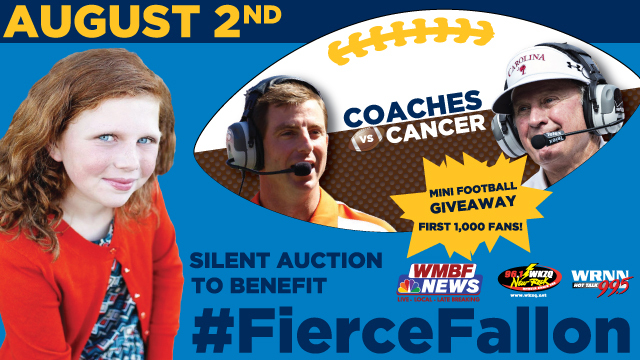 The proceeds of the Coaches vs. Cancer silent auction will benefit Fierce Fallon. The auction will feature autographed items from various college and professional coaches including Spurrier, Swinney, Will Muschamp (Florida Gators Football), Clint Hurdle (Pittsburgh Pirates) and more. Those that wish to support can also donate at www.fiercefallon.com. For tickets to the August 2 or any Pelicans home game call (843) 918-6002, visit www.MyrtleBeachPelicans.com or stop by the Pelicans box office, which is open Monday through Friday from 10 a.m. to 5 p.m. and Saturday from 10 a.m. to 2 p.m.